You often hear people say “you either love it, or you hate it,” about certain things, and with cilantro that certainly seems to be the case. Even self-professed culinary adventurers sometimes find themselves at a roadblock with the herb, complaining of a soapy or bitter flavor. Julia Childs hated cilantro so much that she told Larry king in 2002 that if it made its way into a dish she was eating, she would just pick it out and throw it on the floor. Other people love the herb. Its unique flavor is found in cuisines all around the world, having spread across several continents from its native southern Europe, northern Africa, and southwestern Asia, even making its way across the sea to central and south America (while it’s known as cilantro in most of North and South America, in Europe and other parts of the world it’s called coriander). In spite of its ubiquity, it seems that people are split over cilantro’s culinary value. Its polarizing effect is so infamous that it has inspired several groups of scientists to search for a genetic link to revulsion of the herb. And it turns out there is one… maybe. At the University of Toronto, geneticists polled a group of 1,400 young adults about their opinion of cilantro. They found that people of different ethnicities have distinct impressions of the herb. While only 3% of respondents with a Middle Eastern background reported disliking cilantro, a whopping 21% of those with an East Asian background reported an aversion to the herb. Another study of 25,000 people, from the genetic analysis company 23andMe, found a correlation between aversion to the herb and one single spot located next to a group of odor-detecting genes – specifically, next to a gene that is responsible for picking up on the soapy aromas that some people report tasting in cilantro. Yet another attempt to pinpoint the source of cilantro aversion studied twins. Based on their cilantro preferences, scientists were able to isolate three more genes that could be responsible for how we interpret the herb’s flavors. Jay Gottfried, a neuroscientist at Northwestern University, has the answer. In an interview with the New York Times, he explained that though someone’s brain may have an immediately negative response to the smell or taste of the herb, repeat exposure can help expand and change the brain’s perception. “I didn’t like cilantro to begin with… But I love food, and I ate all kinds of things, and I kept encountering it. My brain must have developed new patterns for cilantro flavor from those experiences, which included pleasure from the other flavors and the sharing with friends and family. That’s how people in cilantro-eating countries experience it every day. Meanwhile, anthropologist Helen Leach has suggested that, as with many other foods, the cultural opinion of cilantro has fluctuated over the years. Though cilantro was a very common herb throughout Europe during the Middle Ages, it fell out of favor near the turn of the 17th century. Leach found references to coriander in French and English agricultural books that inaccurately traced the etymology of coriander to a reference to crushed insects and bed bugs, and the books were generally disparaging of the herb. She theorizes that this was a reflection of a subconscious attempt by cooks at the time to distance their food from the medieval dishes and flavors of the past. While some people genuinely just disliked the herb, the widely held negative opinion of cilantro at the time was likely a result of cultural trends. So, if you passionately hate cilantro but are bothered by having to constantly pick those little green leaves out of your food, there is hope. Surround yourself with cilantro-positivity and attempt to retrain your brain. To speed the process, cilantrophobes might want to try it in pesto. 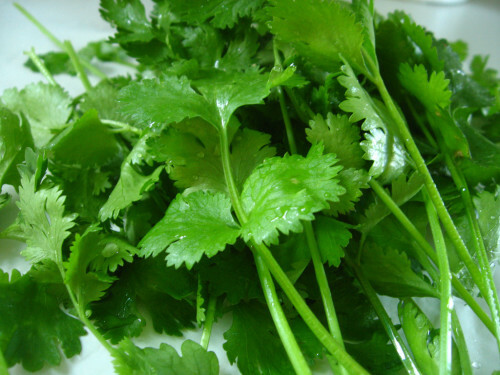 Crushing the cilantro leaves releases an enzyme that helps mellow out the more potent aromas and flavors. And if you already love the stuff, try not to evangelize – no one wants an arrogant, cilantro-loving know-it-all friend to be proved right!